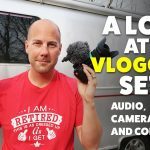 On this week’s Airstream Life vLog Steve tells you about our air conditioning woes. We also finally install an Oxygenics Showerhead to help with water flow when we’re boondocking. We think the flow feels stronger and it apparently uses a lot less water! We’ll have to see if we notice a difference.